Zlatan Ibrahimovic scored the only goal as Paris St-Germain edged fourth-tier Wasquehal in the French Cup. PSG named a strong side for their round of 64 match against the Championnat de France Amateur side but had to wait an hour to open the scoring. The hosts defended well in the first half, and forced two saves from Salvatore Sirigu. But the game's decisive moment came when Ibrahimovic headed home, a goal which he barely celebrated. 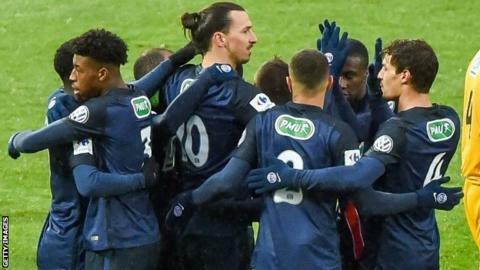 PSG, who are 19 points clear at the top of Ligue 1, are chasing a second consecutive French quadruple and have not lost a domestic match since March. Meanwhile, Wasquehal are third in Group A of the CFA, a largely amateur league with four points for a win, two for a draw and one for a defeat. The game was played at the Stadium Lille Metropole near Wasquehal to enable a larger attendance. Ligue 1 side St Etienne avoided a huge shock when they beat fifth division Raon-l'Etape on penalties. The minnows, who drew 1-1 over 120 minutes, had the chance to win the shootout but missed the 10th kick and then lost in sudden death. Lyon had no such worries as they thrashed Limoges 7-0, with Maxwel Cornet and Rachid Ghezzal scoring twice each. On Saturday, third-tier Chambly produced the shock of the round as Wilfried Louisy-Daniel's hat-trick helped them beat Ligue 1 Reims 4-1.